Cream together butter and egg mixture with the dry as best you can. Add in water, vanilla, peanut butter, and brown sugar. Roll into 1-inch balls and place on an ungreased cookie sheet. Remove from oven and place on wire rack to cool for 10 – 15 minutes. 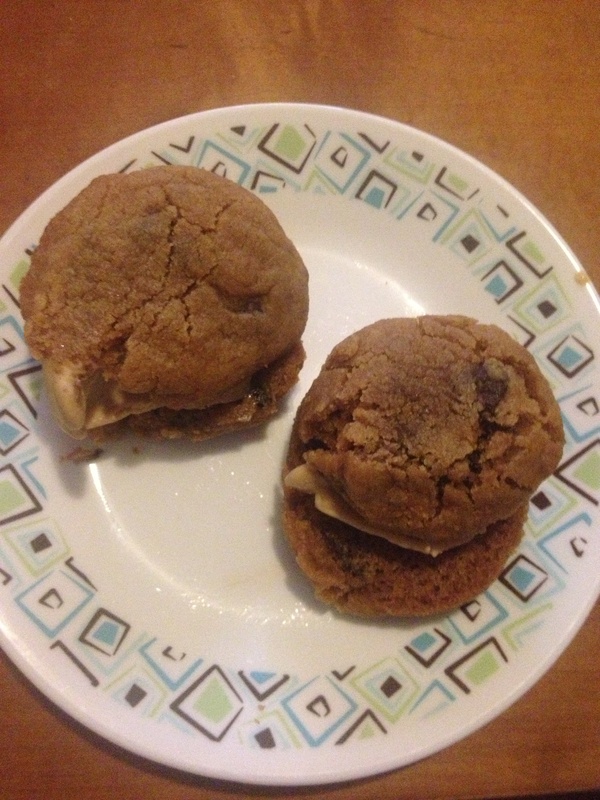 Peanut Butter Chocolate Chip Cookie Ice Cream Sandwiches with Steve’s Ice Cream in Cold Brewed Coffee Cinnamon! Warm, gooey chocolate chip cookies with a hint of peanut butter…oh yea! J These are one of my FAVORITE cookies now. If you have been searching for a great GF mix for cookies that is delicious, King Arthur’s Gluten Free mix is perfect for any mix in. Try adding your favorite mix-ins to this recipe. Sweetened shredded coconut? SURE! Nuts, go crazy! Today is National Chocolate Chip Cookie Day. It is ALSO Founder’s Day for my sorority Alpha Delta Pi! 161 years of being the first and the finest sorority! How fun that on our founders day is also a perfect day to bake delicious chocolate chip goodies! I’ve already posted a few chocolate chip goodies in the past. So today, I decided to get creative with the classic chocolate chip cookie! Let’s get baking!! First make your cookie dough filling. In a small bowl, sift together the gluten free flour, baking soda and salt. In a medium bowl, whisk together the butter, sugars, milk and vanilla until smooth. Whisk in the dry ingredients and the chocolate chips until smooth. Refrigerate for 15 to 30 minutes or until firm. Scoop out dough into 12 balls. Freeze for at least 30 minutes. While your cookie dough balls are in the freezer, make your cupcakes. Preheat the oven to 375ºF. Line a cupcake pan with 12 liners. In a large bowl, whisk together the flour, cocoa, sugar, baking soda and salt. Add the water, oil, egg and vanilla and whisk until smooth. Use a spatula to scrape the sides and bottom of the bowl to ensure all ingredients are combined. Fill each cupcake liner 1/2-2/3 full. Take your cookie dough balls out of the freezer and gently press a one ball into the center of each cupcake, only submerging the ball 1/2 way. Bake the cupcakes for 19-21 minutes, or until a toothpick inserted into the cupcake portion of the cupcake (not tested through the center where the dough is), comes out fairly dry. Chunks/pieces of cake are okay, just not moist batter. Cool the cupcakes completely before frosting. To make your frosting, in the bowl of a stand mixer, cream together the butter and sugars until smooth and creamy. Add the flour, milk and vanilla and beat on high until well combined. Pipe swirls of frosting onto each cupcake. Sprinkle mini chocolate chips on top! ENJOY this cupcake take with a classic cookie! I can never get enough cookies! Gooey, chocolately mmmm mmm good! Preheat oven to 350ºF. In a stand or electric mixer, beat the butter and sugars until well combined. Beat in the eggs and vanilla following the caramel sauce until well combined. Place the flour, salt and baking soda into a large bowl; mix. Slowly add to wet ingredients then add the mini chocolate chips. 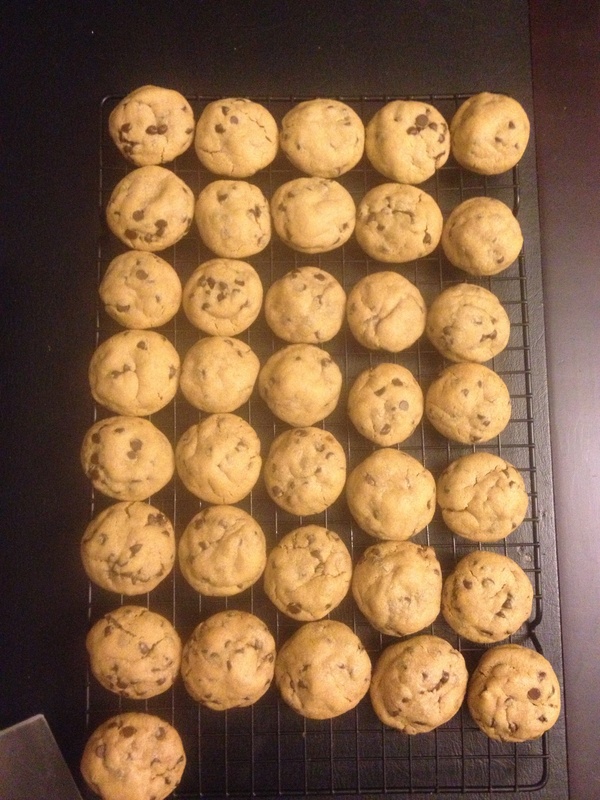 Place 1/4 cup of cookie dough on a cookie sheet. Press down then sprinkle with a pinch or two of sea salt then press chocolate chunks over top. Bake for 12-15 minutes or until just golden around edges. Remove and let cool for 5 minutes before transferring to a cooling rack. These bars can be served warm or cool. 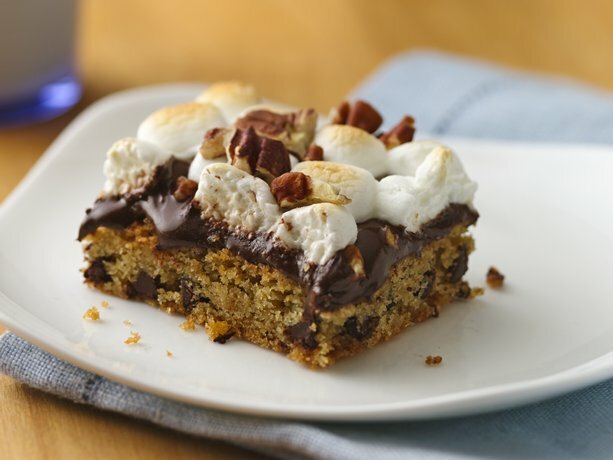 Warm bars are very yummy and the best, but are definitely ooey-gooey, so definitely serve these on a little plate with a fork. Heat oven to 350°F. Spray bottom only of 13×9-inch pan with non-stick vegetable cooking spray. In large bowl, mix butter, egg, vanilla, and sugars until blended. Stir in cookie mix until soft dough forms. Press dough evenly in pan. Bake 20 to 25 minutes or until top is golden brown and center puffs slightly. Immediately sprinkle chocolate chips over the top. Let stand 3 to 5 minutes or until chocolate begins to melt. Gently spread chocolate evenly over top of cookie. Set oven control to broil. Sprinkle nuts and marshmallows over melted chocolate. Broil with top 5 to 6 inches from heat 20 to 30 seconds or until marshmallows are toasted. (Watch closely; marshmallows will brown quickly.) Cool 30 to 45 minutes to serve warm or cool completely, about 2 hours. For bars, cut into 6 rows by 4 rows so everyone gets a delicious piece! Store tightly covered. Gotta love cookies. Gotta love M & M’s. But the two together and you have a winning combination. Add some peanut butter and rice cereal and you’ve got a cookie that will have you smiling from ear to ear and wishing you had made a second batch. Maybe you should – there won’t be any leftovers! Heat oven to 350°F. In large bowl, stir butter, peanut butter and egg until blended. Stir in cookie mix until soft dough forms. Stir in M &Ms and cereal, breaking cereal apart as dough is stirred. Onto ungreased cookie sheets, drop dough by rounded tablespoonfuls about 3 inches apart. Bake 11 to 13 minutes or until edges are light golden brown. Cool at least 2 minutes; remove from cookie sheets. Cool completely before storing in airtight container. On the second day of Yummy, Kwegyirba gave to me…a chewy gooey recipe! The Oreo may be America’s favorite cookie, but in my opinion, the classic chewy homemade chocolate chip cookie is where it’s at! 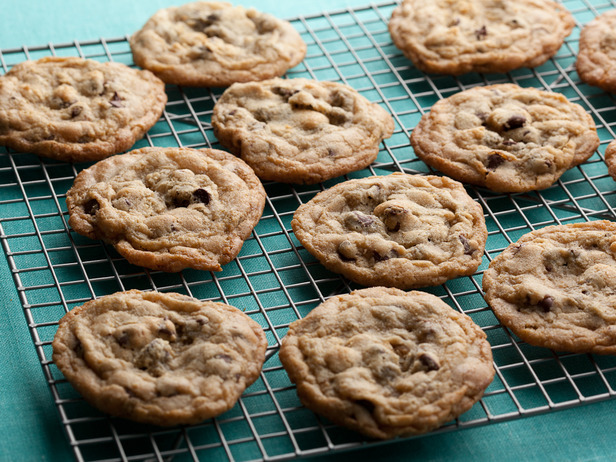 There is nothing like that fresh out of the oven taste of the perfect chocolate chip cookie. The dough is perfect, the chocolate is melted and extra sweet and the kitchen smells good enough to eat! One of my favorite television chefs is Alton Brown and he has created a wonderful Gluten-Free Chewy Chocolate Chip Cookie recipe seen on FoodNetwork.com. Alton Brown is such a fun chef! If you haven’t checked out his show Good Eats it’s definitely a good show to watch. He doesn’t just cook, he teaches and does a little history all while being quirky and whipping up something delicious each episode. Did you know that the chocolate chip cookie was an accident? 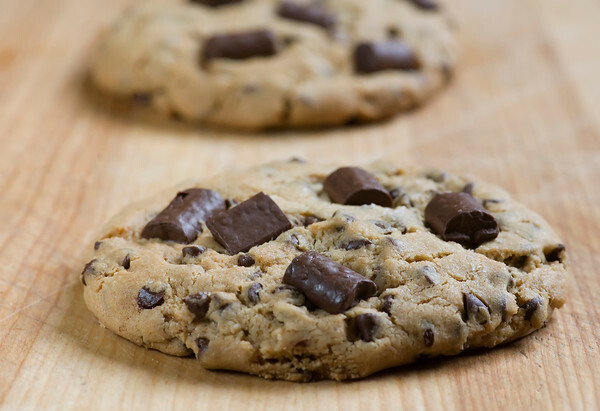 The chocolate chip cookie was accidentally developed by Ruth Graves Wakefield in 1930. She owned the Toll House Inn, in Whitman, Massachusetts, a very popular restaurant that featured home cooking in the 1930s. Her cookbook, Toll House Tried and True Recipes, was published in 1936 by M. Barrows & Company, New York. It included the recipe “Toll House Chocolate Crunch Cookie”, which rapidly became a favorite to be baked in American homes. I say that is one sweet mistake. Thank you Ms. Wakefield! Melt the Earth Balance Buttery Spread in a heavy-bottom medium saucepan over low heat. Once melted, pour into the bowl of a stand mixer. Add both of the sugars to the bowl with the butter and using the paddle attachment, cream together on medium speed for 1 minute. Add the whole egg, egg yolk, rice milk and vanilla extract and mix until well combined. Slowly incorporate the flour mixture until thoroughly combined. Add the chocolate chips and stir to combine. Chill the dough in the refrigerator until firm, approximately 1 hour. Shape the dough into 2-ounce balls and place on parchment-lined baking sheets, 6 cookies per sheet. Bake for 14 minutes, rotating the pans after 7 minutes for even baking. Remove from the oven and cool the cookies on the pans for 2 minutes. Move the cookies to a wire rack and cool completely. Store cooked cookies in an airtight container. Try these delicious variations to your Chewy Gluten-Free Chocolate Chip Cookies! 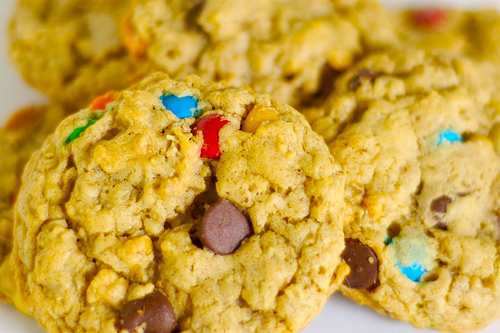 The M&M cookie, or party cookie, replaces the chocolate chips with M&M’s or your favorite (and gluten-free) chocolate candy.